HONG KONG, China, May 15, 2014 (ENS) – The Hong Kong government today began the destruction of its giant ivory stockpile in a message to elephant poachers and illegal ivory traders that illegal ivory has no commercial value and their activities will not be tolerated. The first batch of the city’s 29.6 metric tonnes of ivory of confiscated ivory was burned to ashes following a ceremony attended by Secretary for the Environment Wong Kam-sing and other Hong Kong officials. 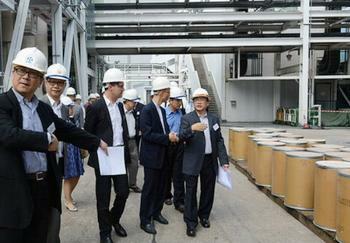 The incineration of the city’s stockpile could take up to two years to complete, Hong Kong officials said. It will be the largest ivory destruction event anywhere in the world, dwarfing recent ivory burns in the United States, France and mainland China. The ivory was cut into small pieces and burned in drums in a rotary kiln with chemical waste. The ashes will be mixed with cement and lime and formed into blocks, which will be landfilled. “The destruction of confiscated elephant ivory does not negate the cultural heritage of historic ivory carvings, nor will it in itself put an end to the illegal trade,” said John Scanlon, secretary-general of the Convention on International Trade in Endangered Species, CITES, a treaty joined by 180 governments. “However, coupled with the seizure of ivory and prosecution of offenders, it sends a powerful message that Hong Kong SAR, does not accept and will not tolerate this illegal trade or the devastating impact it is having on the African elephant and on the livelihoods of rural communities,” said Scanlon, who traveled from CITES headquarters in Geneva to witness the ivory incineration. 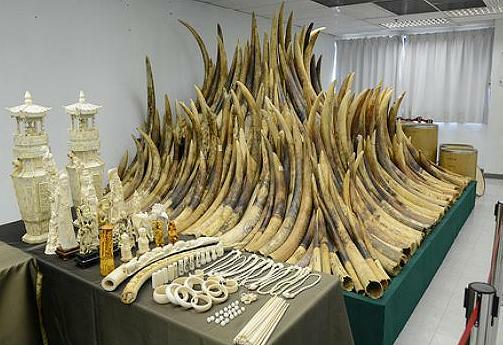 Before the incineration, Environment Secretary Wong said the city is serious about stopping trafficking in endangered species and that all future ivory seizures also would be incinerated and landfilled. “It is our duty to ensure that the international trade in these species is properly regulated and that any illegal trade is effectively dealt with,” said Wong. A major transit hub and end-use market for ivory, Hong Kong is ranked fifth in the world in terms of the quantity of ivory seized since 1989, when a global ban on commercial trade in elephant ivory took effect. Scanlon recognized Hong Kong’s “unique and important position, both culturally and economically” as a major consumer of wildlife products and as a transit point to mainland China. “In addition to dealing with huge volumes of daily shipments, I understand that the Customs service of Hong Kong SAR sees about 100 million passengers passing through its gates each year to travel to Shenzhen in mainland China, where the largest Customs team in the world operates. This makes the work of the Customs and CITES officers on both sides of the border most challenging,” said Scanlon. Wildlife conservation groups were pleased by Hong Kong’s initiative, but said more needs to be done before the world’s elephants are safe from poachers. WWF and and its wildlife trafficking monitoring branch, TRAFFIC, are now calling on the Hong Kong government to ensure tighter monitoring and control over the legality of ivory sold on the local market. 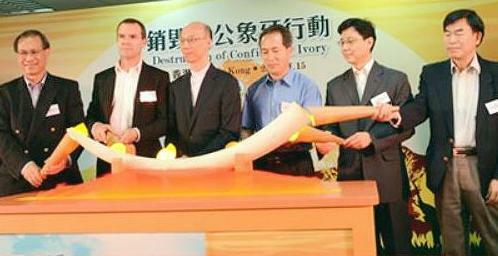 They are urging the Hong Kong government to strengthen the domestic regulation of ivory trade by making the public display of commercial licenses mandatory in all retail shops which legally sell ivory products. The groups also want Hong Kong officials to conduct independent audits of any stocks to be destroyed. This will allow Hong Kong to become a global role model for accountability and transparency. Because Hong Kong’s regulatory system needs to be strengthened, WWF and TRAFFIC are also urging Hong Kong consumers to stop purchasing any ivory products to aid efforts to conserve elephants. Roughly 22,000 elephants are being killed each year. Recent figures show that the population of African elephants dropped from three to five million in the early 1900s to around 500,000 today. The population of Asian elephants, a species classified by the International Union for the Conservation of Nature as Endangered, has also dropped from 100,000 in the early 1900s to an estimated 40,000-50,000 today.